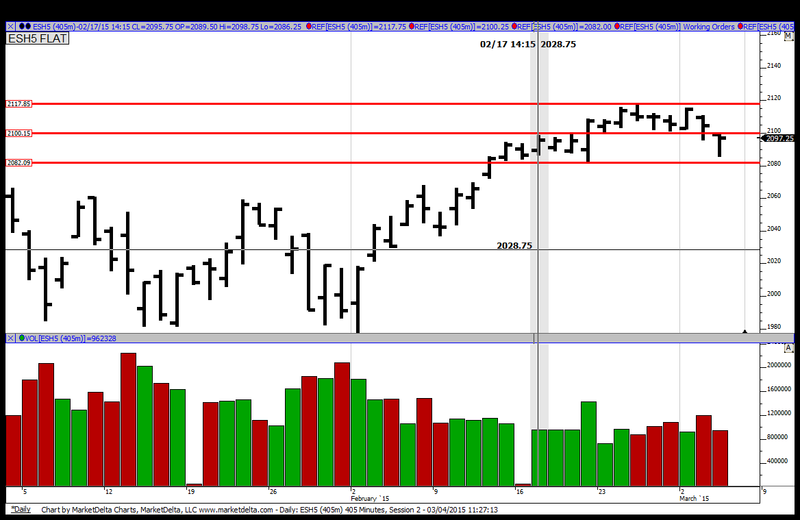 and for those who follow the bands - The WEEKLY 1/2 SD band based on 7 days came in at 2085.75 !! good to see ya here and I agree ..don't be afraid......many small losses and then a good win can make your day........!! Look at the picture below. It is a daily bar chart. My thinking last night was to be focused on the middle line. YD we broke through it but failed to close below it and ended up back in the range between the top and middle lines. Today we opened below the middle line, tried very briefly to get above it, went below and triggered all the stops that Joe mentioned. This was another classic setup that simply had to be taken as this was a falling out of balance trade, which usually does a massive stop run. As Bruce mentioned, then 2/20 (the last big up bar that brought us into this upper range) came into play and we could look at it's HTN and LTN nodes for a stopping place. And to boot, I had a greenie at 85 too so that was really a logical place for the market to stop if they were just doing a stop run and not new sellers coming in. All this makes sense. Just need to see it in real time as it unfolds. I need to do a better job preparing for the day and come in with all these scenarios thought out and planned for. Joe, thanks for your suggestion. I will go back and do that study tonight after the market closes. Thanks for sharing that CharterJoe!!! Bravo...that is awesome you caught that move down....I have EU IB low at 99.25..guessing yours was near there? Time wise you are looking for 3-4am EST to give you your range?